Today I was able to get out on the lake and give the new Gullwing paddle a workout. The first thing that I noticed was the unique curve of the shaft which made the paddle comfortable to handle and the eva grips gave you a nice cushioned grip.. The curve on the blades are angled to cut through the water better and help create better speed when paddling. The first thing that I had to do was adjust my paddle stroke because the design of this paddle actually lets you glide along with less effort. I did notice that once the adjustment was made the kayak was moving faster through the water with a lot less effort. Another thing that was unigue is instead of the paddle coming apart for storage in the middle, which I have always found to be a weak point, the Gullwing actually has the shaft as a solid piece and each blade locking in. The paddle is very sturdy with no flex, powder coating on the lightweight aluminum shaft, which also has reflective decals on both sides to help you get noticed better. The unique angle of the shaft also made it stay in place instead of rolling around when you put it down to cast. I really enjoyed using the paddle today and look forward to the next trip out. By the way, I got skunked today because the heavy boat traffic had the water muddied up and made you feel like you were on a rollercoaster. My first impression of the Gullwing reminded me of those really cool Corsairs flown by the Black Sheep Squadron on that 1970s televison show Baa Baa Black Sheep. For those who are too young to recall the antics of Pappy Boyington and his squadron of misfit fighter pilots, treat yourself to a google search.... really great stuff. The Gullwing paddle is the first ergonomically designed kayak paddle with a unique gullwing shape. Remember those WWII Corsairs, well.... add a couple of black nylon/fiberglass blades to the ends and you’ve basically got a kayak paddle with the spirit of world class fighter plane. The paddle has a one-piece curved bar. Just insert the paddle blades and start stroking. Breakdown is a snap and storage shouldn’t be an issue. The bar is about 54 inches long without the blades, so it fits into my truck bed without any problems. Depending on what you drive, you may need to think about how you’ll transport it, but it really isn’t a big issue. The Gullwing comes with two black comfort grips that give it a nice, balanced feel. Only two lengths are available at this time: 215cm and 230cm. The lightweight aluminum bar is painted battleship grey and it has a textured matt-like finish and a reflective strip. The weight of this paddle checks in a 2 pounds 9 7/8 oz according to my scales. I thought this was heavy, then I checked my AT and it topped out at 2 pounds 10 ¼ oz. I couldn’t believe my AT weighed this much, but then again, I never checked it. Out of curiosity, I weighed my wife’s Werner. It came in at 1 pound 13 oz…. but that weight savings came with a heavy price. Check out the Gullwing at www.gullwingpaddles.com. Being a fisherman first and kayaker second I’m always looking for something to make my paddling experience easier. So when I read the slogan of a new paddle company “Why dig when you can glide” they immediately got my attention. A few months ago I managed to get a hold of Arthur Carlow the inventor and designer of the Gullwing kayak paddle. When I expressed my interest in this new design Art immediately sent one out to be put through its paces. I received the paddle a few days later; opening the box I found one solid shaft and two curved blades. I snapped the blades onto the paddle shaft and everything fit together smoothly “the blades are removable for easy storage and replacement”. I did notice the lack of drip guards in the package and made a mental note to pick some up next chance I had. My first trip using the Gullwing kayak paddle was a few weeks later down in Jacksonville FL. I was in my Native Ultimate 14.5 and was amazed at the amount of power I was able to generate from those curved blades. The high sides and low seating position of the Ultimate proved to not be the best choice of kayak for the Gullwing. The curve of the paddles shaft caused my hands or paddle shaft to bump into the sides of the kayak. I also tried using the Gullwing like all my other paddles with vertical strokes and immediately noticed the drip rings I forgot to purchase! 30 minutes into the trip I was soaked. I stand in my kayaks almost 50% of the time so being able to us my paddle standing up is a must. 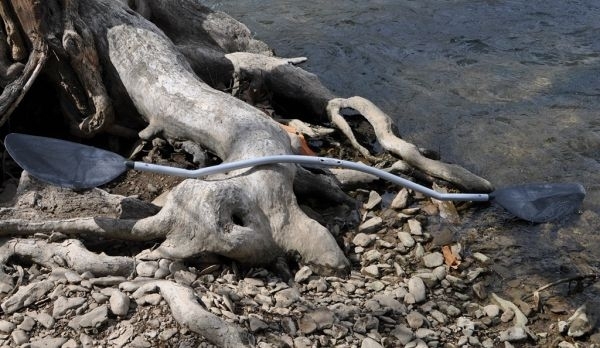 The curved shaft made it hard to stand and paddle, it wanted to twist in my hand with every stroke. This also made it difficult to paddle and maneuver with one hand. After getting back from Jacksonville I contacted Art, about my issues and mentioned he should think of adding drip guards to the paddle. He explained that I was using the paddle incorrectly; the Gullwing was meant to be used with low horizontal strokes. With a horizontal stroke water drips off the paddle blade before getting into the kayak. With my new found knowledge I took the paddle out for round 2. 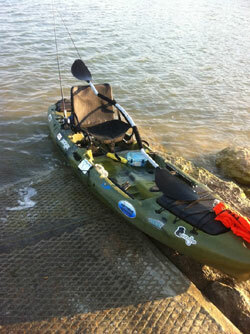 This time is was on a much more typical kayak used for fishing, an Ocean Kayak Prowler Trident 11. Using the proper horizontal strokes made a world of difference. My clothes stayed dry the water rolled right off the paddle just like Art had said. My arms and shoulders didn’t fatigue nearly as quickly with the Gullwing. The curved shaft also allowed me to place the paddle down across my lap without it rolling all over the kayak. 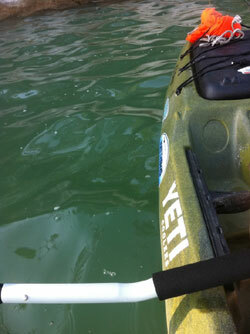 All in all a huge difference paddling the Ultimate vs. the Ocean kayak with the Gullwing paddle. Your higher seating position and the lower sides are ideal for the Gullwing’s curved shaft. Bottom line, is the Gullwing kayak paddle for everyone? 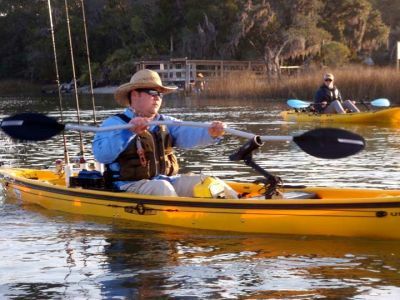 No… I wouldn’t recommend this paddle for the kayak angler who stands frequently in their kayaks or if you own an extremely wide or high sided kayak like the Native Ultimate. I would recommend this paddle for everyone else, if used like it was intended the Gullwing paddle truly does glide instead of dig.